The overall water stock in the state’s dams have increased by three per cent compared to the same period last year. 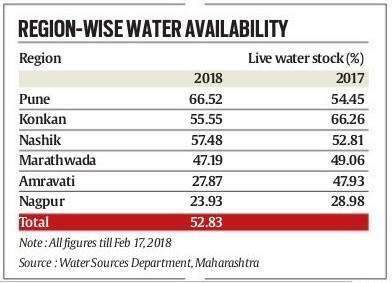 WITH SUMMER approaching, Pune residents can take comfort from the fact that the 725 small, medium and large dams in the region have 66.52 per cent live water stock still available for use. According to the latest data provided by the state Water Resources Department, out of the five dams that supply drinking water to Pune and Pimpri-Chinchwad, four — Khadakwasla, Pawana, Panshet, Warasgaon — have 12 per cent more water stock this year compared to the same period last year. Presently, Panshet holds the most water stock at 81.20 per cent, as against 76.85 per cent in 2017. The other three dams have water stock over 60 per cent. Water stock at these dams remain high even as summer approaches and the consumption of water increases. The rate of water evaporation also gets higher as summer gets closer. “The Pune region had received very good rainfall during the last monsoon and all dams had crossed their optimum capacity in September itself. It is a good indicator that there is sufficient water stock remaining even as we slowly switch to summers,” said an official at the local flood control department. Similarly, the overall water stock in Maharashtra, at 52.83 per cent, was three per cent higher than the total available stock in February 2017. However, worry looms over Amravati and Nagpur regions in Viadarbha, along with Marathwada, where dams stocked more water last year than the amount presently available. Last year, 443 dams in the Amravati region had a total of 47.93 per cent water as opposed to just 27.87 per cent this year. Likewise, water stock in Nagpur region has dropped from 28.98 per cent in 2017 to 23.93 per cent this year. The Marathwada region had 49 per cent water stock last year, as opposed to 47.17 per cent in 2018. To counter any water crises early on, the water supply and sanitation department has initiated supply and installation of metal water tanks in villages that have been identified as water stressed. 102 such villages, said GSDA authorities. “Instead of concrete water tanks, which not only cost more but are also time-consuming to build, we will be switching to metallic tanks which are easy to assemble. These tanks also need lesser maintenance and have a longer life,” said a senior official handling the Jalswarajya-II mission at GSDA. A detailed ‘development plan report’ (DPR) for stressed villages, where hydrologists are planning to introduce numerous water conservation measures including the setting up of specialised tanks, has been finalised. Most villages under this category are located in Satara and Raighad districts, where nearly 30 villages will get additional community storage tanks.